Frank Plumpton Ramsey (1903-1930), Cambridge mathematician and philosopher, was one of the most brilliant people of his generation. He lived in an extraordinarily stimulating milieu, surrounded by figures such as Russell, Whitehead, Keynes, Moore, and Wittgenstein. Ramsey's highly original papers on the foundations of mathematics, probability, economics, philosophy of science and the theory of kno… wledge were very influential in the 20th century and are still widely discussed in the 21st.Perhaps two of Ramsey's achievements outshine all the rest. One is his treatment of the theoretical terms of scientific theories and the other is his deflationary account of truth. In 'Theories' (1929) he showed that, for any theory, it is always possible to offer an empirically equivalent one that does not contain theoretical terms by re-expressing it in what later became known as 'Ramsey sentences'. His account of truth was rediscovered in the 1960s and is now known as the 'prosentential' theory of truth (according to which to say that a sentence is true is simply to assert or reassert that sentence, not to ascribe the property of truth to it).This collection of eleven new papers, specially written to commemorate his centenary, answers a crying need for more secondary literature on Frank Ramsey. 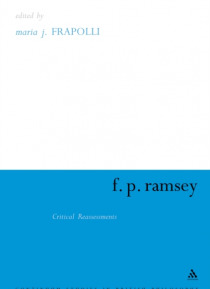 Nearly all the aspects of Ramsey's work are examined: his logic, philosophy of mind, philosophy of science, metaphysics, epistemology, pragmatism, economics, and the mutual influences between Ramsey and Wittgenstein. The book will be eagerly welcomed by those working in many branches of analytic philosophy and beyond.